When Walt Disney presented his seventeenth movie – One Hundred and One Dalmatians – in 1961, the Studio strayed from its mainstay approach. Where they had come to be known for creating fictitious worlds with fantastical characters, Disney chose the existing majestic city of London. In addition, the movie was set in the same time period as its release. The film was met with high praise, and was one of the highest grossing films in 1961. It became a benchmark in animation history. 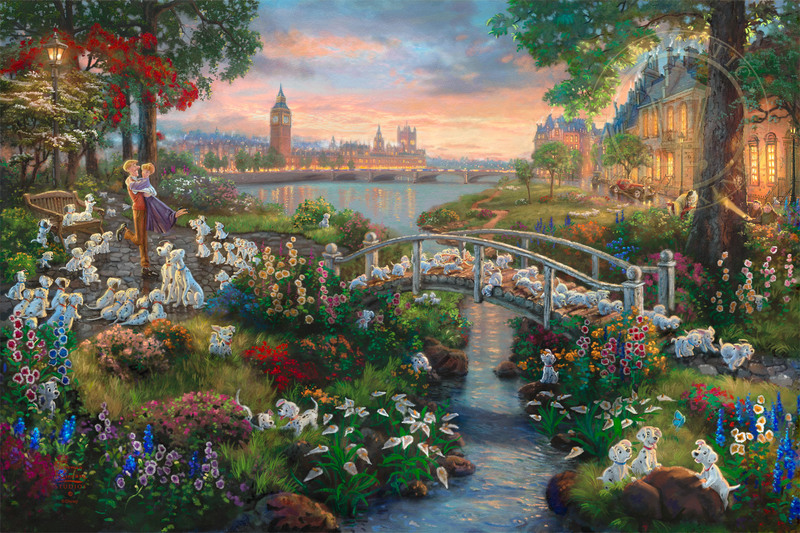 Now for fans who have loved this story for decades, Thomas Kinkade Studios has transformed the iconic film into a brilliant take-home piece as a part of the Disney Dreams Collection, titled Disney 101 Dalmatians. Take a visual tour of historic London, with all of its famous landmarks, while you listen to the cheerful sounds of frolicking puppies. With the help of Pongo and Perdita, a romantic spark sets this timeless adventure in motion, creating a sea of spots and attracting the deviant eye of Cruella De Vil and her not-so-helpful henchmen.